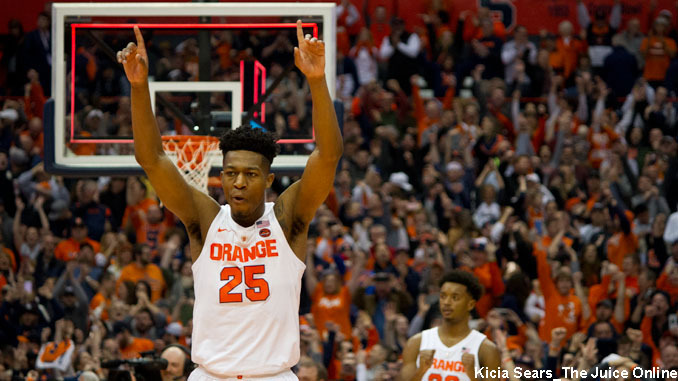 Dec 8, 2018; Syracuse, NY, USA; Syracuse guard Tyus Battle (25) celebrates following the Orange's 72-71 win over Georgetown at the Carrier Dome. Mandatory Photo Credit: Kicia Sears, The Juice Online. Former Syracuse basketball player Andrew Kouwe chats with Wes Cheng about the 2019 NCAA Tournament. Andrew breaks down SU’s matchup with Baylor, a potential matchup with Gonzaga and makes his predictions on who will win it all. Wesley Cheng: Andrew, Syracuse is an 8 seed in the west region, they will start in the first round by playing ninth seeded Baylor. What are your general thoughts on this matchup to start? Andrew Kouwe: I think overall it’s a good matchup first round for Syracuse. We’ve had pretty good success over the years against the Big 12 teams. Especially my year, the year we won it, we were pretty much crowned Big 12 champions. The one thing that is tough is having the 10 p.m. game on the west coast. That just messes a little with your overall routine. That’s pretty much a midnight game for them. 5. Who will win the west? 6. Who will win the NCAA Tournament?